Parsley often is taken for granted, yet its sprigs are essential for perking up a bland dish, add colour to a special meal, or dress a glass of tomato juice. It is a key ingredient in bouquet garni and in fine herbs. 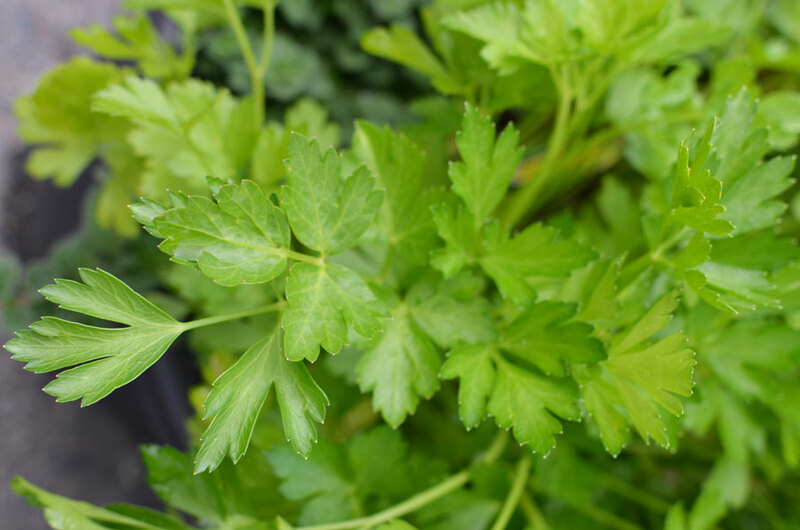 Whether it is curled or flat-leafed, parsley is one of the most widely used culinary herbs. Its green leaves are used to flavour soups, butters, savoury stews, and as a garnish. Parsley leaves make a delicious and nutritious addition to salads. Tear freshly picked leaves and sprinkle them over or mix them into your mixed salad greens. 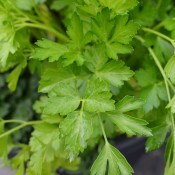 Flat-leaf parsley has a stronger flavour than the curly-leaved variety. 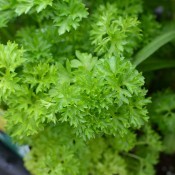 Parsley is a fantastic mixer plant for containers. Its bushy growth and tightly curled leaves fill in quickly the spaces among the other plants in your containers. The bright green colour creates a good background for bright red, scarlet or orange flowers. Parsley is extremely beneficial to asparagus, chives, corn, onions, roses, and tomatoes because it attracts predatory insects. Do not plant near mint. Harvest the leaves when the plants are about 6 inches (15cm) tall. Cut stems about 1 inch (2.5cm) above the crown so the plants can produce more leaves. Wash leaves, blot dry, wrap in paper towel, and put parsley in a plastic bag in the refrigerator for up to a few days. To freeze leaves, spread them on a baking sheet and put in the freezer; then transfer into freezer containers. Dry whole sprigs, crumble the leaves and store in airtight containers.